When it comes to cordless mowers the more power (voltage) they have the more likely they are to perform like a traditional gas-powered mower. Yard Force has taken this to the extreme with their 22" mower. Where many mowers we've previously covered offer 56V to 82V of power, Yard Force has chosen to go all out. 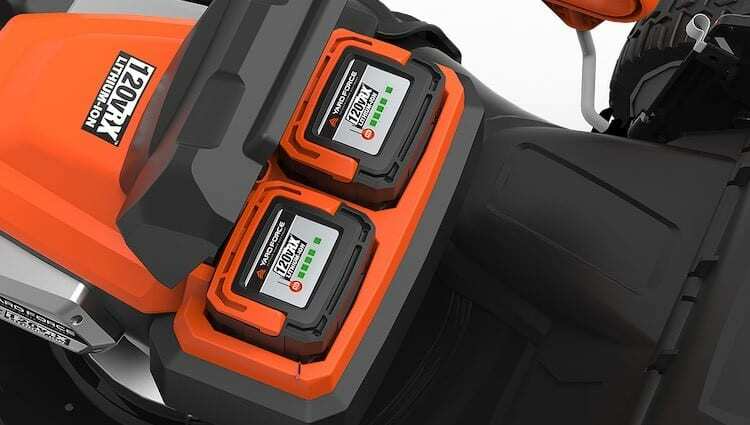 The YF120VRC utilizes dual 120V lithium-ion batteries. This is practically 40V MORE ​than the closest competition. This translates to more power, more torque, longer run time, better mulching, and more efficient bagging. 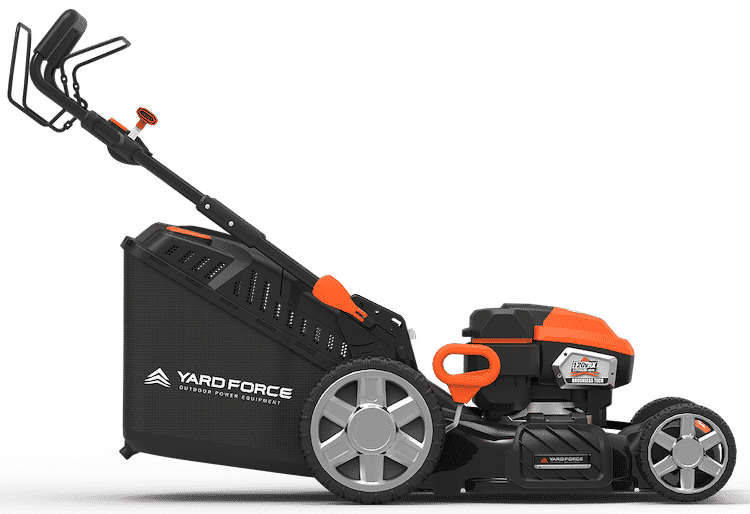 ​The folks at Yard Force wanted this mower to be the closest thing you could buy to a traditional lawn mower, but without all the headaches and maintenance required with a gasoline engine. Not only did they give it TONS of power with their 120V brushless motor, but they built the rest of the mower to match. It's unusual to see a steel deck on an electric lawn mower. They're typically constructed of commercial-grade plastics to keep weight down. But the Yard Force offers a 22" steel deck that is both durable, and relatively light. Features & Performance of the YF120VRX 22"
​In addition to the dual 120V batteries and steel deck the Yard Force offers a handful of other impressive features. I've always been partial to mowers with larger rear wheels as this makes maneuvering much easier. The wheels on the Yard Force are ​8" in the front and 12" in the back. This makes it much easier to maneuver in tight spaces. The steel deck offers 7 different cutting heights ranging from 1.25" to 4". You can quickly adjust the deck height with the handle that is located just in front of the right rear wheel. Even with the heavier steel deck adjustments are quick and painless. ​The mower offers 110 minutes of runtime (based on using both batteries), but I found that I could leave one battery in the charger while mowing with the other. By the time the first battery was dead, the second was ready to rock. Using this method you could mow just about any size yard as each battery charges in about 40 minutes. As with other manufacturers Yard Force has based their entire line of electric components on this same battery platform. So you can get a weed trimmer and blower that utilize the same batteries. The self-propelled feature operates extremely well. You can set the speed in 5 positions from anywhere between 1.75MPH and 3MPH by pushing forward (fasters) or pulling back (slower) on the speed lever on the handle. While I've tested other self-propelled battery powered mowers, this is the first that has handled both tasks so well. The 82V Snapper offers a self propelled model, but it doesn't match the cutting power of the Yard Force. 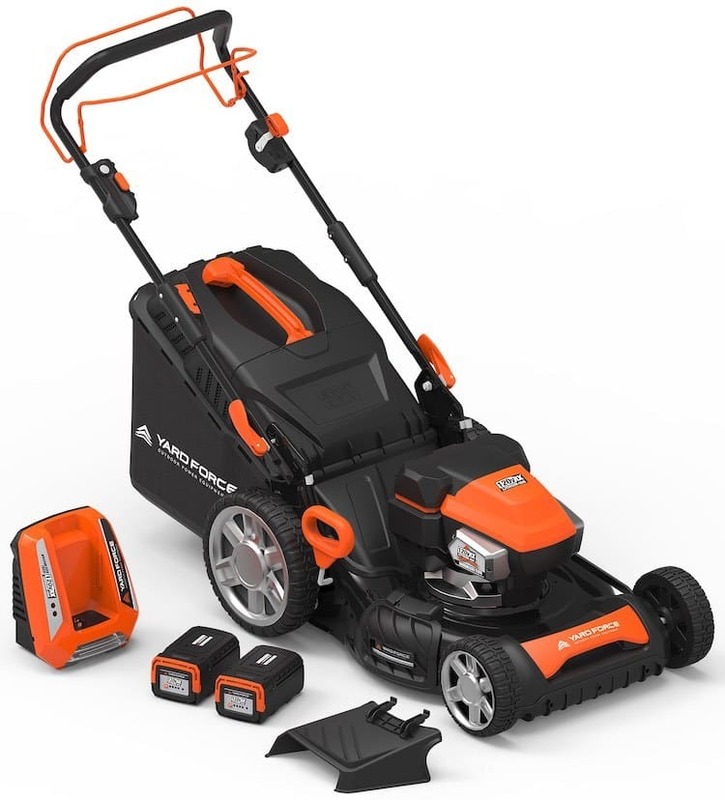 As with most mowers that incorporate brushless motors the Yard Force has "sensing technology" that adjusts the speed of the cutting blades based on the thickness of the grass. Basically this means it automatically applies more power when needed. This feature is nice, but it requires a bit of getting used to. Inevitably the mower senses that it needs more power slightly AFTER you hit thicker grass. To get the best results you should get used to slowing down as you approach the thicker parts of your lawn to avoid clumping or uncut grass. ​While I compared the Greenworks (80V) and Snapper (82V) as being the closest thing to date to traditional mowers, the Yard Force is the first one I've tested that actually DOES perform as well as a gas engine. The additional voltage allows it to power through thicker grass and still mulch (or bag) efficiently. One of my biggest complaints with most of the cordless mowers we've tested to date has been with their mulching and bagging performance. The blade speed and suction required to properly and consistently mulch or bag grass clippings has been beyond the power capabilities of many mowers in this class. The Yard Force does NOT suffer from these same issues. The additional power supplied by the 120V motor and battery system performed extremely well in both operations. The test patch of grass I used for mulching showed no signs of clumping or missed spots. Again it's worth noting that slowing down as you approach known thick spots can help immensely. Bagging was comparable to my old Honda push mower which I found to be one of my favorites in terms of leaving no grass behind. The 18.5 gallon bag is easy to attach and remove and has a built in full indicator. Between the powerful self-propelled engine and the larger back wheels I found this to be one of the most maneuverable mowers I've tested in the electric category. The bar to engage the self propulsion is similar to other mowers. It's easy enough to use, while incorporating standard safety features. One of the biggest benefits of electric mowers is their small storage footprints. 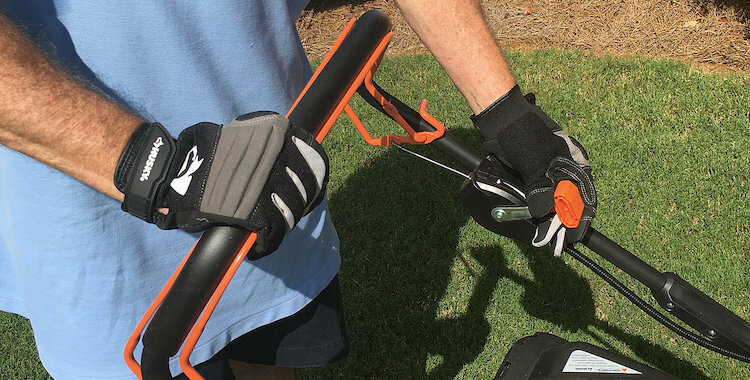 The Yard Force folds up and can be stored in half the space required of a gas mower. This coupled with the fact that you don't have store gasoline and oil for the mower also makes your garage smell significantly better. The Yard Force is comparable to other battery powered models we've tested in term of noise output. It sounds very similar to a box fan running on high speed. This is much easier on your ears when mowing and I would venture that your neighbors won't hear it even if you were right outside their window. One of my least favorite parts of testing lawn equipment is assembly. The Yard Force basically ships ready to go. Simply pull it from the box and unfold it. Pop the batteries in the charger to top them off. Then throw them in the mower and you're ready to go. It doesn't get much easier than that. With its 120V battery system the Yard Force is the most powerful cordless electric mower we've tested to date. It offered mowing capabilities that match most gas powered mowers and far exceed other electric mowers. The mulching and bagging capabilities are better than any other electric we've tested and are on par with powerful gas mowers as well. When you take into consideration the small storage footprint, low noise levels, and no gas and oil requirem​ents the Yard Force is tough to beat.